"It Is Game Time Kids"/"Reunion"
Probst loves a finale! And I continue to hate this live variety-show framing format the show has settled into. Anyway, six players remain! Laffy Taffy has an extra vote. Donathan is dropping the truth bombs. Laurel has been loyal, which is so boring. Angela is a player who has been on this show all season, I am told. Wendell and Dom have been running the show and both have idols. The game is far from over! But come on, it’s going to be Wendell or Dom. Dom wants to target Sea Bass next even though Donathan is erratic. Sea Bass is tired of sitting in the back seat behind the big boys. He’s a big boy too! 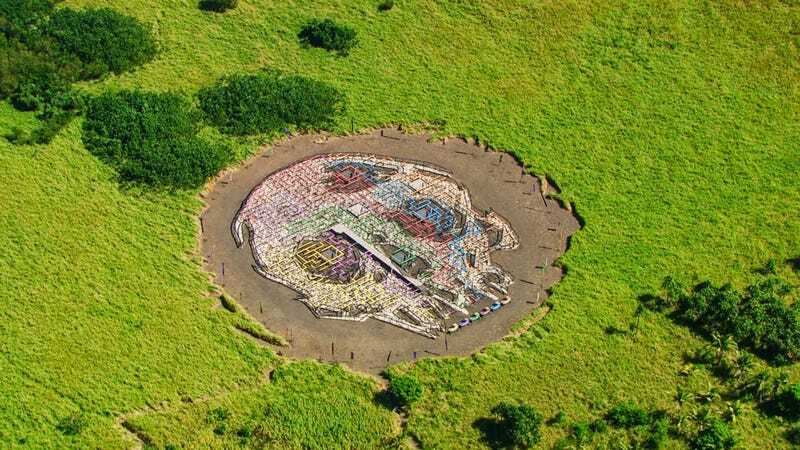 I love this giant skull maze! Wendell finishes the puzzle first and remembers to call Probst over. He gets a steak dinner and invites Sea Bass and Angela. A little jury management! Laurel says the gloves are off, but we’ll see. Wendell tells his fellow feasters that Donathan is the target. Anti-Dom sentiment is brewing. For no good reason, Angela spills the beans to Dom, who blows up the plan at tribal council. He bluffs with his fake idol. Wendell put on all his jewelry. Dom plays his fake idol. Everyone votes. Dom gets up and announces the idol is a fugazi. After all that, Sea Bass gets voted out anyway. And he never played the extra vote. What? The immunity challenge comes down to a four-piece pyramid puzzle, and Wendell wins a necklace he doesn’t really need. At least he can use his idol as a negotiating tool, if that’s even necessary at this point. Dom thinks Laurel is the biggest threat, but still doesn’t trust Donathan. Laurel makes some feeble case about wanting to be at the end with Dom and Wendell because they’ll split the vote and she might squeak out a win. I don’t see it! At tribal council, Dom plays his idol for himself and Wendell makes a big speech about showing loyalty to Laurel by gifting her with Erik’s necklace. She gets one vote that doesn’t count and the rest go to Donathan. Probst brings him out on the live show, which...he didn’t do that with Sea Bass. But I guess Donathan is an inspirational story. He’s also very nervous! Sia is giving him $10,000. Didn’t Tai get 100 grand? Oh well. One last “Come on in, guys!” for the season. Immunity involves stacking balls while wobbling. Wendell pulls ahead, but his stack collapses and Dom is able to pull it off. He gets to pick one opponent for the final tribal while the other two compete in a fire-making challenge. I hated this twist last season because it felt so contrived to keep Ben in the game. But at least now everyone knows ahead of time what the deal is. Dom isn’t bringing Wendell to the end. Laurel doesn’t want to make fire. Angela’s not crazy about it either. Dom gets to bring a cursed voting urn to tribal council, which is the final lame Ghost Island choice of the season. Dom considers giving up his necklace to take on Wendell in the fire challenge. Ooookay, buddy. He doesn’t do that. Angela faces off with Wendell, who doesn’t want the orange flag, and Angela agrees to switch. I swear, only two people know how to play the game this season. If you have a psychological advantage, keep it! Anyway, Wendell wins easily. Final tribal! It looks like the producers have recast Angela. We’re already two hours into this, so the reunion is going to be about 2o minutes. Laurel’s social game doesn’t get much respect from the jury. Wendell apparently spent too much time off on his own. Dom is awfully smug and keeps interrupting, but his game is getting the love. Michael appears to be running the jury. Sea Bass thinks Dom’s theatrics weren’t cool, bro. The jury votes! Probst reads them right there, because...it’s a tie. First ever! Laurel is the final jury member and casts the deciding vote. Probst brings the cursed urn back to the studio audience to read the vote, which is for Wendell. Erik’s necklace is uncursed! There’s not much left for the reunion. Probst doesn’t give the final three much time before jumping to Michael and Chris, and then to James and Erik, who were not on this season. But hey, why not humiliate them one more time? Also Kevin Hart. What? They really don’t do a reunion show anymore, just a weird mishmash of Probst-isms and CBS promos. Anyway, Ghost Island was not a great season by any means, but I’m good with how the final tribal played out. Survivor really needs to be stripped down to the basics and rebuilt from the ground up, though. There are just too many idols, advantages, swaps, and twists floating around these days, and not enough time spent on getting us to care about the players. I have my doubts that will happen on David Vs. Goliath, but Survivor has reversed its fortunes too many times for me to write it off now.